Based on almost 70 years’ experience in the field of fluidics, Bürkert – with the introduction of the device platform EDIP – will meet the increasing market demand for electric integration solutions. While the number of signals remains manageable in view of the combination of several valve functions, the quantity of information increases significantly with the integration of sensors. With competence in solenoid valve technology and expansion in the direction of solenoid valves, measuring and control technology, Bürkert in 1996 launched the first mass flow meters (MFM) and mass flow controllers (MFC) for gases, which on a small scale represent the ideal combination of valve and sensor technology. In the future, the new device platform EDIP will standardise the control, communication and interfaces of many process devices. The platform consists essentially of three pillars: communication, software and hardware. The spinal cord and connecting link of EDIP is a digital interface that corresponds in many ways to the CANopen standard and is always downward compatible with the latter. This concept requires no master. All peers have equal priority and can receive a functional address from the user. The message recipient (consumer) monitors the information provider (producer) and reports an error if the information is not delivered. All electronic Bürkert devices will support this interface in the future. Another important module of EDIP is the PC software “Communicator”. 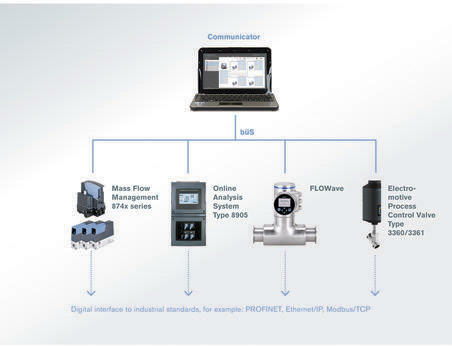 The MS Windows based program is used for configuration and parametrisation of all new Bürkert products with electrical components and can be downloaded at no charge from the company’s website. In addition to the basic function of configuration / parametrisation, the software also features a data logger, oscillograph, graphic programming interface and license management. Settings configured with the software can be saved, modified, printed and transferred to other devices. Access to the network is possible during operation and the option to connect several devices simultaneously also exists. EDIP can be used to implement different modular hardware systems. For example, the device platform is suitable both for compact field devices, IP protected modules and for use in switch cabinets. The two new products that were first presented at last year’s Hannover Messe (FLOWave and the online analysis system) as well as two of this year’s new products (mass flow management and motor valves) are based on EDIP. Through these products the platform is currently being used successfully in drinking water treatment, burner control, gas injection applications and the pharmaceutical industry. Users of EDIP benefit from a standardised interface that ensures interoperability with freely programmable functions. The modular design of the platform allows the adaptation of devices to individual customer requirements and also enables short delivery times. With its user-friendly control and display concept EDIP enables faster and easier startup as well as uncomplicated transfer and backup of device settings. Convince yourself by visiting us at Hannover Messe 2015: Hall 9, Stand G16.